Ready or not, the low-carbon future is at Canada’s doorstep. And most Canadians have begun to embrace it. Recent polling shows that solid majorities of Canadians, across all provinces and across all political parties, want their federal government to act on “very serious” climate change. Majorities also support paying up to $50 a month in carbon taxes or cap-and-trade -- many times more than B.C. residents have been paying since 2008, when that province's pioneering carbon tax kicked in. And three-quarters of all Canadians have already joined a joint cap-and-trade effort with several American states, including California, whose economy alone is the size of Canada’s. The Conservative government says “climate change is one of the most serious environmental issues facing the world today.” Prime Minister Stephen Harper committed the nation to matching U.S. climate-pollution cuts of 17 per cent from 2005 levels. As Harper and others have said many times, Canada’s economy can’t afford to be out of step with the U.S. on climate action. The good news, according to Canada’s latest greenhouse-gas (GHG) inventory, is that from 2005 to 2008, the combined emissions of all the provinces -- except Alberta -- fell by 10 million tonnes a year. Most Canadians now see the threats and opportunities posed by climate pollution. Most are already taking action. And most want more action now. 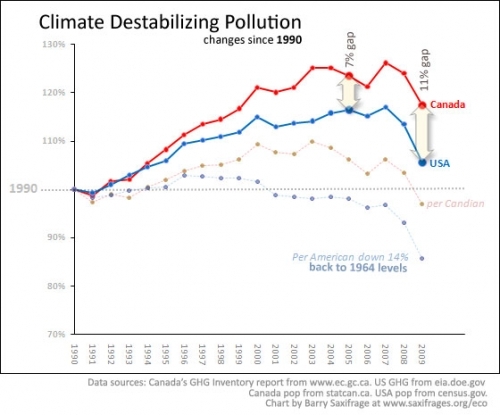 Unbeknownst to most Canadians, America under presidents Bill Clinton, George Bush and Barack Obama has been quietly but steadily removing climate pollution from their economy much faster than Canada. In 1990, Canadians made the same amount of money per tonne of carbon dioxide (tCO2) as Americans. Not anymore. Now, Americans make hundreds of dollars more per tonne, and the average American now takes home a $5,000-a-year bonus as a result. More than a third of the world’s clean-tech venture capital reportedly flows into California alone. The gap between the U.S. and Canada in reducing both total CO2 and CO2 per capita has been widening for decades. The average American’s climate-pollution footprint has fallen over 20 per cent in the last decade and is now down to 1964 levels. In fact, Americans are already most of the way to meeting our shared target of a 17 per cent national cut by 2020. What many Canadians don’t understand is that Americans have been spurred on by a powerful, de facto “carbon tax”. It is not official -- but it is just as real as an official tax. At $90 a barrel, the average American spends $1,000 a year on imported oil.1 This money siphon -- $1.3 trillion in the last four years -- has grown to represent nearly half the U.S. trade deficit. The rise in oil prices over the last month alone is estimated by economists to be enough to knock at least half a percentage point off the growth of the U.S gross domestic product (GDP). “The United States’ continuing addiction to oil presents a serious threat to our national security and economy.” It's a refrain heard almost daily across the U.S. Even the American military, the biggest single oil consumer in the world, has committed to huge percentage of oil cuts by 2020. Oil, not coal, is the main source of CO2 pollution in the U.S. -- and Americans are paying dearly for it. Their oil comes with a large de-facto economic penalty, and they want out. “Why should a dried-up little country like Libya with a crazy dictator play havoc with America's economic security?" Burning coal for electricity is the second biggest source of CO2 in the U.S. And again, there are significant built-in costs to Americans for this emissions source. The international Deutsche Bank sees the coal share of U.S. electricity dropping nearly 30 per cent by 2020. Kevin Parker, global head of asset management for the bank, says that "Coal is a dead man walkin' ... Banks won't finance (coal-fired plants). Insurance companies won't insure them. The (Environmental Protection Agency) is coming after them." Meanwhile, the U.S. is seeing other cleaner electricity sources become cheaper than coal. New U.S. electrical generation is becoming cleaner because it is cheaper to be clean. Natural gas is one example. But more surprising to most people is that solar has been the fastest growing new power source for years, and that since 2007, wind has averaged 35 per cent of all new electricity sources – double that of new coal and new nuclear combined. In fact, new wind is now significantly cheaper than new coal and has recently hit price parity with natural gas: about 6 cents/kWh. The Canadian government’s National Round Table on the Environment and and the Economy (NRTEE) recently released a “Climate Prosperity” report with up-to-date economic analysis and modeling. The study shows that because Canada has so much more left to do, it now needs an official carbon price 45 per cent higher the U.S. does to reach our shared 2020 goal. NRTEE recommends that Canada institute an official carbon price now, even if the U.S. doesn’t create its own official price. Without doing so, Canada risks falling even farther behind. The roundtable modelling shows clearly that delay will bring greater risks and end up costing us more in the long run.